The University of Bath Discovery Dome is an immersive space for people to discover different topics and to engage with topics in new ways. The dome uses a projection system to provide a full 360o experience, with lights and sounds to transport you to our solar system. This 20 minute show will take you on a journey to explore space. After blasting off in a rocket we'll visit each of the eight planets in our solar system to find out what they are like. Before returning to Earth you'll get to see what our galaxy might look like and experience 'floating' in the stars. 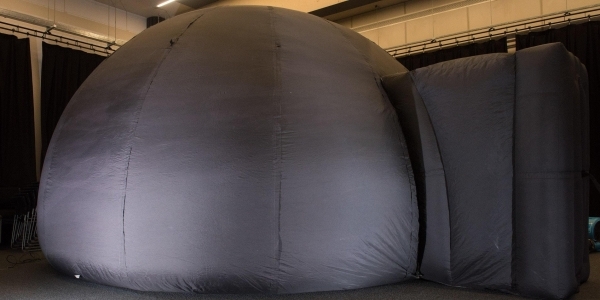 The Discovery Dome shows are part of a wider Launch Event for the Bath Taps into Science Festival. There will be lots of other activities occurring at the same location, including crafts, interactive science exhibition stands, demonstrations, and talks. The whole event will run from 10am-3pm, so feel free to stay around before/after the show to enjoy all there is on offer. Please select one slot to reserve your free ticket. The tickets are free of charge, but we do have an option to donate towards the organisation of the festival. The Bath Taps into Science Festival is run by the University of Bath, but is funded through sponsorship and donations. All money raised from your donations will support future festivals. Ideally, you will bring a printed ticket or use the Eventbrite app so we can check you in. If you don't have either on the day do not worry, we can check you in manually using your name. No, the show is suitable for all ages, but please be aware that the Dome is an enclosed space with lights and sounds. It also may not be suitable for young children afraid of the dark. The shows are avaible as part of a larger event at the Edge on the University of Bath campus. Parking is available in the East Car Park of the University. For more details see the University of Bath parking webpages. The Edge is close to the bus stops which have direct buses (route U1) running at regular intervals to and from Bath City Centre. All the details of how to get to the University are on the University travel information webpages. You can email us at bookings@bathtapsintoscience.